Mary obtained her doctorate in chemistry at Oregon State University in early 2017. Her area of concentration is analytical chemistry, and she is interested in the transport, transformation, and remediation of environmental contaminants. Prior to her graduate studies, she worked in both government and industry performing analysis of small molecules in biological matrices. Mary joined the Simonich laboratory this spring as a post-doctoral research associate. One of her first contributions to the Superfund Research Program will be the development of a high performance liquid chromatography-mass spectrometry (HPLC-MS) method for analysis of hydroxylated polycyclic aromatic hydrocarbons (OHPAHs) in aqueous systems. 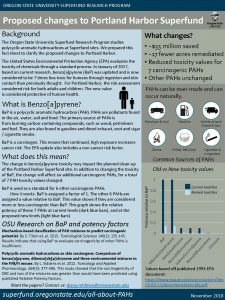 Polycyclic aromatic hydrocarbons (PAHs) are environmental contaminants generated by the incomplete combustion of organic compounds, such as those found in fossil fuels and cigarette smoke. 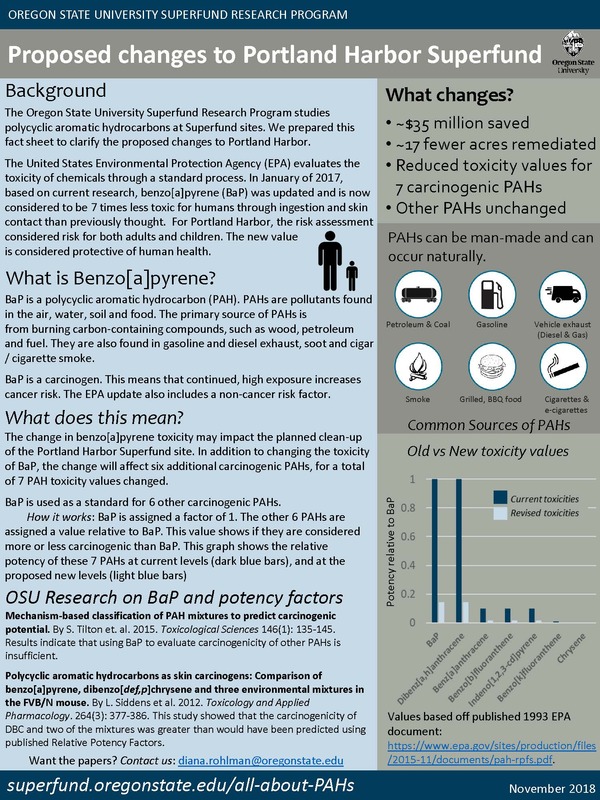 Several PAHs have been identified as mutagens or probable carcinogens, and chronic exposure to these compounds is associated with increased risk of developing lung cancer and peripheral arterial disease. PAHs are metabolized by mammals and some microbes to form hydroxylated PAHs, or OHPAHs. Some OHPAHs are more carcinogenic than their parent compounds, because they can cause oxidative damage to DNA, resulting in cell mutations. Microbial transformation of PAHs to OHPAHs should thus be considered when evaluating the effectiveness of bioremediation strategies. Gas chromatography (GC) is typically used for separation of parent PAHs in complex environmental matrices. Following separation on a GC column, the PAHs can be detected and quantified by mass spectrometry (MS). However, analysis of OHPAHs by GC-MS is not as straightforward. OHPAHs must be chemically modified, or derivatized, prior to separation by GC. Derivatization increases sample processing time, and it can complicate identification and quantification of target compounds. Reverse phase high performance liquid chromatography-mass spectrometry (HPLC-MS) circumvents the need for derivatization. OHPAHs can be separated and quantified by HPLC-MS without modification, resulting in shorter analysis times and improved separation. This past fall, we traveled to the Pacific Northwest National Laboratory (PNNL) for training in computational analysis of RNA-seq data. During this two-day externship, we worked with PNNL scientists as they walked us through our data and gave us an overview of computational approaches they use to analyze RNA-seq data. During the externship we were provided hands-on experience with computational methods under the guidance of experts. Our ultimate goal was to apply what we learned at PNNL to current and future RNA-seq projects. Our work at PNNL centered around an experiment that compared regenerating vs non-regenerating caudal fins of zebrafish, which is a phenomenon of interest for a variety of applications. The regenerating caudal fin model is a useful toxicological tool for chemical screening, and is well-suited for studying how chemical exposure can lead to changes in molecular signaling events that occur during the wound healing process. Furthermore, regeneration and development share many critical signaling events, making this model useful for interrogating mechanisms of developmental toxicity. By using a systems approach to understand expression patterns of mRNA and miRNA during regeneration, we can improve our understanding of molecular processes involved in wound healing. This would allow us to be better-informed when making hypotheses about the mechanisms of toxicity following chemical exposure in zebrafish. Given the applicability of this model to developmental toxicology, the results from this experiment will be particularly useful for future directions of SRP Project 3. Age is a known factor of regenerative ability, and different life stages are frequently used in various toxicological studies. This was incorporated into the experiment using age-based cohorts and we learned methods to compare age-dependent differences in gene expression during regeneration. Drs. Joe Brown and Jason Wendler, both computational biologists at PNNL, trained us over our externship on a variety of methodologies including quality control, read alignment, statistical inference, biological pathway enrichments, and data visualization methods. Over the course of the two days, we covered many computational methods involved in RNA-seq data analysis, which will be useful in our other ongoing projects, as well as future work as our careers progress. We are also grateful for the opportunities for professional networking outside of our typical academic circles. We learned quite a bit about the mechanics of working in a national laboratory and how that is different than working for a university. We are appreciative of the time and effort put in by Drs. Brown and Wendler, and we also thank Dr. Katrina Waters who helped organize our trip to PNNL. Working with the RTC, SRP trainee Sydelle Harrison coordinated a campus visit for students from the Confederated Tribes of the Warm Springs Reservation and the Confederated Tribes of the Umatilla Indian Reservation (CTUIR) on May 13-14. Students went on a campus tour, ate lunch at the Eena Haws Native American Longhouse Annual Salmon Bake, and met with Dr. Rohlman (CEC, RTC) to learn about recent tribal-university collaborations (more information available here). The tour culminated in a hands-on lab activity wherein students learned how to isolate DNA from strawberries as a proxy for understanding how SRP investigators can learn underlying genetic determinants of disease by analyzing DNA. This event was a collaborative effort between the Research Translation Core, Training Core, Administrative Core and Community Engagement Core.